MEDIA BLAST CABINET BB1060LED-BVR-HV is an abrasive blasting method used to remove deposits of surfaces without causing damage to the original surfaces. Generally, a blast cabinet is used as a means to remove calcium buildup from pool tiles or fungus deposits and it can also be used as a means to brighten grout which has faded, due to a build up of dirt or contaminants. In addition, bead blasting can be used as a means to clean pools and is used by many auto body shops as a way to remove old paint from a motor vehicle. 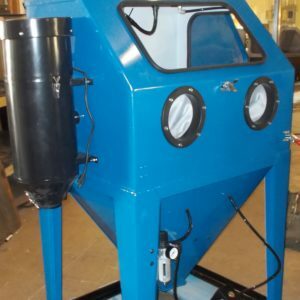 The BADBOY Blasters website will give the online shoppers a chance to find a custom building bead blast cabinet, or any other type of abrasive blasting cabinet, such as a cabinet to house hydro blasting equipment, wheel blasting or micro-abrasive blasting equipment. Since the bead blast cabinet is custom designed, our company can take the bead blast requirements of our customers and create a cabinet that will enhance bead blasting. 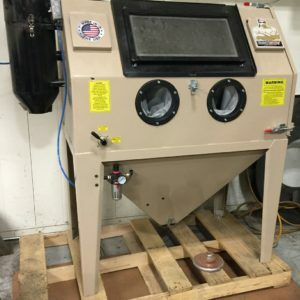 Other than the bead blast cabinet, the online shopper can find several other abrasive blasting equipment and accessories, such as abrasive blasting media, as well as replacement parts for blasters. Common features of the MEDIA BLAST CABINET BB1060LED-BVR-HV include 14 gauge steel legs, an internal florescent lighting system and a durable and long-lasting foot valve assembly and twin air regulators or gauge panels. BADBOY Blasters is a family-owned company and we are committed to offering our customers access to the best bead blast cabinet on the market, along with the expert technical advice and after-sales support. Buyers who are eager to purchase the bead blast cabinet will be more than impressed by the huge range of blasters and custom built cabinets as well as our dental and jewelry blasters, vacuum blasters, and the blasting media and abrasives. Abrasive blast, such as bead blasting, is the use of a force that will propel the abrasive material, which in the case of bead blasting is glass beads, at a particular surface. Even though bead blasting is used as a means to remove calcium build up or paint, blasting can be used to smooth a surface or roughen a surface. Other abrasive blast methods, such as sandblasting, are used as a means to etch images onto glass. Our range of bead blast cabinets can be seen on our website and because we custom build the bead blast cabinets, our online shoppers can be assured of finding a bead blast cabinet which can best meet their needs.